Cockney double-act Chas and Dave may have rejected the "Costa Brava and all that palaver" for a trip down Margate. But since the veterans' 1982 song, many holidaymakers have opted for a cheap package holiday to Spain rather than "jellied eels at the cockle stall". The Victorian seaside town has become synonymous with empty shops, shabby seafront bedsits and high unemployment. Can the opening of the £17.4m Turner Contemporary art gallery really help Margate discover a new future? Anne-Marie Nixey runs a boutique, selling contemporary Chinese furniture in the heart of Margate's Old Town. Three years ago, she gave up a teaching job and moved from London to Margate with her partner. Ms Nixey, who chairs the Old Town Action Group, believes the area is fast becoming a cultural hub, where quirky independent shops, eateries and galleries are starting to flourish. "Margate is rough around the edges," she said. "It's quite raw and it's very edgy and these things enhance it, not detract from it. "Whenever an area gets its rough edges knocked off, it gets to the place where you almost want them back. People say that about Brighton and The Lanes. "You can see a lot of people working really hard to make something special." Part of the challenge will be to make sure visitors from London and further afield do not just visit the gallery and catch the first train home. Ms Nixey said that was not the case when Tracey Emin, who grew up in the town, unveiled her latest artwork last year. Visitors came to see the neon sculpture, which marked 12 months to go until the gallery's planned opening date. Ms Nixey said: "The Old Town really rallied around so that when people came down here they did not just come down to see the Turner Gallery. "They then dispersed into the town and went to see what was going on and have an experience beyond what Turner could offer at that time." Gallery director Victoria Pomery has said that the success of the project will largely depend upon the impressions of first-time visitors. "Word-of-mouth is so important", she said. "We need these visitors to be leaving having had a great experience of the town." 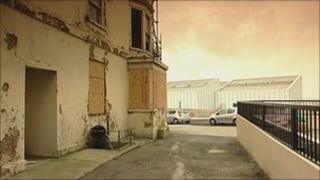 Thanet District Council agrees, saying the opening of the gallery is a "unique opportunity" for a clean-up. It has been busy introducing new signage, lighting, and seafront shelters, and plans to demolish or bring back into use "eyesore" buildings such as the derelict Fort Road Hotel. But supporters know the long-term success of Margate does not rely on the gallery alone. The Conservative MP for Thanet, Laura Sandys, has bought together business leaders and politicians to develop a tourism strategy. Campaigners want to reopen Margate Caves, which were closed to the public seven years ago, while Hornby, which is famous for making miniature railway sets, has opened a visitor centre at its Margate base. In addition, funding of £10m has been secured for the restoration of the Dreamland fairground, which closed in 2003. The Dreamland Trust and Thanet Council have aspirations to re-open the 20-acre site as an amusement park for vintage rides. Ralph Handscomb, the president of Margate Civic Society, said the restoration of Dreamland could play as key a role as the gallery. He said: "[Margate] is run-down but it's beginning to improve. "There's a lot of artists moving in and a lot of cafes. There's Dreamland being renovated and that could bring a lot of people in." Despite the buoyant mood among residents, the town faces numerous challenges. A recent survey revealed that Margate had one of the highest proportion of boarded-up shops in the country. And a BBC-commissioned study last year found Thanet has few high growth sector industries, high unemployment and few people employed in resilient sectors. James Kennell, a senior lecturer in tourism and regeneration at the University of Greenwich, said: "This is a fantastic project but if they expect it to solve all the social problems they will end up being disappointed. "Deep-seated social problems cannot be solved by a gallery, but it can provide a focus for regeneration and bend the arms of politicians and say 'right now you step up to the plate.'" Architect David Chipperfield, who designed the building, said he was not uncomfortable with the weight of expectation upon the gallery. He told BBC South East Today: "I am convinced this will be an important part of regeneration. "I am sure people will come from London but that is not what it should be for. If it only looks to people from London then there is a mistake. "The constituency for the building is the people in this area. They have got to like it and enjoy it and sponsor it, they have got to become fond of it. "People will always get on a train and come to Margate and spend an afternoon here. If it works and if it becomes an important local thing it will [also] become an important national thing." Back in the Old Town, Ms Nixey is one former Londoner who will not be leaving anytime soon. She said: "Margate has its history - the Mods and Rockers and Dreamland - so there's a lot that we can use to our advantage. "I have made more friends down here and I have made things happen. It has the potential to allow people to realise themselves. "I really can't think of being anywhere else." Why are some children staying away from Thanet beaches?